I first met Yousuf Bashir Qureshi (YBQ) on 23 September 2010 at Nawab Restaurant in Manchester where we got together to have a look at the arrangements for the charity Fashion show being organised by International Foundation for Mother and Child Health (IFMCH). Yousuf had travelled from Karachi Pakistan on a non-commercial venture to help a fellow Pakistani raise funds for his charity that aims to do something about improving women's health in Pakistan. Yousuf's dress sense evokes different emotions among people of different backgrounds. 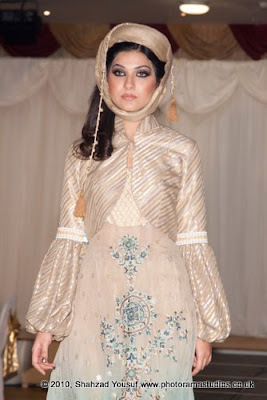 His designs have deep roots in country life in Pakistan and unlike many he wears his creations. 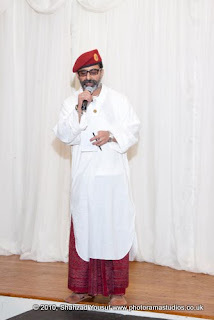 Only Yousuf can combine a Dhoti and Kurta with an military cap and Converse shoes and make it look fashionable and cool. Second time I met Yousuf was a day later at the launch of International Foundation for Mother and Child Health (IFMCH) and saw the other side of him - a passionate charity worker who was promoting his charity United Pakistan while running an auction to raise funds for another charity IFMCH passionately pleading for everyone to come together to raise funds for the flood victims in Pakistan. Video recordings of work done by United Pakistan made every eye full of tears, hearts full of pride and hands went into pockets to get their Zakat out. In our third meeting I saw his passion for Charity that was evident from his demonstration of Life Straw - a water purifying product specially created for poor 3rd world countries and can help provide clean drinking water for families and individuals for flood affected areas in Pakistan. His audience were a group of university students and charity workers in Cheshire who wanted to be involved in doing something concrete for the flood victims in Pakistan. YBQ's belief in the product was evident from the fact that using Life Straw he drank water from a stinking fish bowl that has not been cleaned for over a week. Then I heard him speak on the BBC Radio Manchester programme "Indus" passionately making a case for Pakistani youth and how they are the ones who hold future of this suffering country in their hands. My last meeting with Yousuf was at the Manchester University where he was a guest speaker invited by Pakistani Students Society. A talk to bridge the spiritual and scientific realm between one's brain and heart, how to prioritise the consistent conflicts between the two, and hence, how to become a better decision-maker in life. 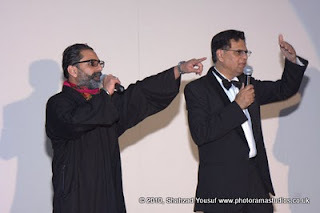 From the man who revolutionised tradition, transcended the boundaries of fusing cultures, gave the values of heritage a fresh, new face - Yousuf Bashir Qureshi, one of the most versatile and talented men of his age from Pakistan. A food scientist, fashion designer, philanthropist and humanitarian, YBQ takes pride in being one of the rare few who use their potential and artistic skills to change the world around them, and is of the belief that through art and artists, we can actually build the soft boundaries that we hear politicians talk about globally. Having graduated as a food scientist and having served on the faculties of FIDM, Los Angeles, FIT New York, and then in Pakistan at the prestigious Indus Valley School of Art and Architecture in Karachi, YBQ hails from a long standing educational background. He has given a number talks at Universities, Colleges & Schools alike around the globe, and is especially reputed for his command on the topic given above. Images and list of activities above were only a fraction of various other activities and events YBQ was involved in infusing passion about Pakistan. He was at pains to highlight that not everything is rotten in Pakistan and not every official functionary is corrupt and useless. Pakistan is country of over 170 million population and only a fraction of the population is responsible for the ills the nation suffers from. The biggest asset the country has is the growing size of youth who have not yet lost the desire to do good and bring change. Islamic Fatwa Mafia from Pakistan is back in action. This time a group of so called religious leaders have got together and issued a Fatwa for beheading of retired General Musharraf. For readers who are not fully aware of the definition of a Fatwa: A fatwa is a religious opinion concerning Islamic law that is issued by a recognized religious authority in Islam. But since there is no hierarchical priesthood or anything of that sort (at least) in Sunni Islam, a fatwa is not necessarily "binding" on the faithful. In Sunni Islam any fatwā is non-binding, whereas in Shia Islam it could be considered by an individual as binding. The people who pronounce these rulings are supposed to be knowledgeable, and base their rulings in their knowledge and wisdom. They need to supply the evidence from Islamic sources for their opinions, and it is not uncommon for scholars to come to different conclusions regarding the same issue. A meeting of religious scholars and political leaders, headed by chief of the Jamhoori Watan Party Nawabzada Talal Bugti, was held at Quetta last Saturday. Religious scholars and politicians, including provincial Ameer of Jamaat-e-Islami (JI) Abdul Mateen Akhwanzada, JUI-N leader Maulana Abdul Qadir Loni, Maulana Noor Muhammad of JUI, Abdul Quddus Sasoli, Hashim Moosavi, Wilayat Hussain Jaffery and others attended the sitting. Now, when a Fatwa is issued as Muslims, we look at the opinion, the reputation of the person giving it, the evidence given to support it, and then decide whether to follow it or not. Speaking on the occasion, Nawabzada Talal Bugti announced $1.3 million as head money for Pervez Musharraf, saying that it is binding on all Muslims under the statement of religious scholars to behead him (Musharraf) as soon as possible.I have written in the past that there are legitimate legal grounds to take General Musharraf to court and hold him accountable for the crimes he committed during his reign. But this is the domain of Pakistani institutions of law and justice and not for political religious party leaders working with the families who have been aggrieved by Musharraf's actions when he was in power. No person or institution other than a court of law has the right to prosecute and determine punishment for Musharraf. According to law, religion and culture, Pervez Musharraf should be sentenced to death, the statement said. This statement describes one of the biggest problems Pakistani society faces right now. When you put Law, religion and culture in the same sentence it becomes a recipe for a disaster. It only takes one fanatic to take the so called politically and revenge motivated Fatwa seriously. If there was ever a time for the Supreme Court of Pakistan to take a suo moto action, it is now. In my opinion all signatories of this fatwa should be brought to court for the crime of inciting murder. So should be Maulana Abdul Aziz of Lal Masjid who has more blood on his hands from the Lal Masjid debacle than Musharraf himself. So should be any other street Mullah who issues a fatwa for killing another human being and takes on the role of Judge, Jury and Executioner when it suits their local political needs. 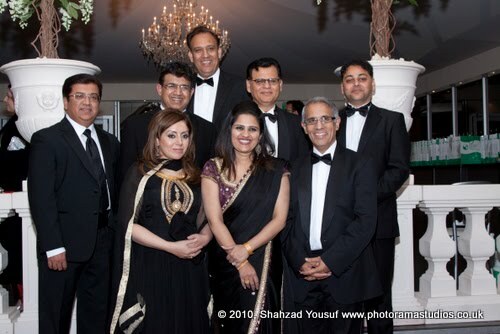 General Musharraf showed glimpse of a seasoned politician when he kept a smile and a brave face when activists of Hizb-ut-Tahrir tried to disrupt his speech at the launch of his political party in Manchester on 09 October 2010. Though Hizb activists unwittingly chanted slogans in favour of Khilafat (Islamic government) rather than anything against the budding politician himself - giving him the opportunity of being magnanimous and asking the bouncers (there were plenty of them) to be polite when throwing the culprits out. Hizb did better job at disrupting the proceedings than a few hundred Pakistan Muslim League (N) activists outside the venue. So the General has finally come out of the Face book and is ready to face the real people in the real world. Unfortunately people running his Face book profile are doing a better job at getting him more fans (over 10,000 more joined since the launch of his party) than the people who were running his first forte in civilian public speaking in Manchester. If he is to do any better in the UK he must get some professional help. A political rally that right up to his arrival on stage gave the impression of a badly organised religious ceremony (Ghiarveen Shareef) does not bode well for a new entrant into politics. In his hey days he would have sacked the whole organising team if it was not for the clinical efficiency of megaphone wielding bouncers whose second job it was to blare slogans shamelessly stolen from the books of Islami Jamiat-e-Talaba or Nawaz Sharif's party. He denied ever having knowledge of a girl call Afia Siddiqui but made it a point to mention that Afia's mother and sister were his great fans. He denied being responsible for deaths and desecration of Lal Masjid in Islamabad but did highlight that there were some very bad men (and no women) in the Lal Masjid who were making life miserable for Chinese prostitutes (sorry! Massage Parlour workers) in Islamabad and our Chinese friends were embarrassing the Pakistan government. He denied his own assertions to Der Speigel that Pakistan Government institutions were behind insurgency in Indian occupied Kashmir but did highlight that he had said that it was some other government in Pakistan that did so. What I did not hear at the rally was a manifesto - a plan to pull Pakistan out of the abyss created by those who are leading Pakistan now courtesy the NRO gifted to them by General Musharraf himself - he is now, on record, sorry about that though. There was a vocal opposition presence outside the Sheridan Suite with the usual effigies, shoe beating, name calling, and cracker firing antics. And I must mention the six or so Caucasian MI6 hunks providing the ever needed security to the General. I strongly believe that our ex heads of state should get the level of security that is commensurate to their stature. I wonder after what happened to Benazir, General Musharraf has stopped trusting our own security services!!! With a political party launch in Manchester of around 3000 people inside the hall the Pakistan Muslim League of General Musharraf has made a good start. One question he and his political team should ask everyone who appear to be supporting them is - "when was the last time you voted in an election in Pakistan?" I asked this question to a number of people who actively support General Musharraf and the answer was never. When asked how do you think that you can get General Musharraf elected back into the government their answer is "through back door - there definitely is a deal with the Americans". I believe that like any other ordinary Pakistani General Musharraf has a right to enter democratic politics. But, this is your biggest challenge Mr Musharraf - those supporting you don't appear to believe in democratic process or elections. During the hey days of his regime in Pakistan Musharraf was respected as a master media manipulator, especially when it came to dealing with the western media, and when promoting the case for Pakistan and for his military rule. Has the master having lost the confidence that comes with wearing a uniform lost his touch. At least it is evident from the recent interview that he gave to Susanne Koelbl of German Der Spiegel. Musharraf wittingly or unwittingly gave India the smoking gun it has always been looking for - confession of a Pakistan ex-ruler confessing on camera that his government has been involved in directly supporting armed insurgency in India. SPIEGEL: Why did you form militant underground groups to fight India in Kashmir? Musharraf: They were indeed formed. The government turned a blind eye because they wanted India to discuss Kashmir. SPIEGEL: It was the Pakistani security forces that trained them. Musharraf: The West was ignoring the resolution of the Kashmir issue, which is the core issue of Pakistan. We expected the West -- especially the United States and important countries like Germany -- to resolve the Kashmir issue. Has Germany done that? SPIEGEL: Does that give Pakistan the right to train underground fighters? Musharraf: Yes, it is the right of any country to promote its own interests when India is not prepared to discuss Kashmir at the United Nations and is not prepared to resolve the dispute in a peaceful manner. Welcome to life of politics General Musharraf! You have now followed into the footsteps of Benazir Bhutto and those before her who when out of power try to find legitimacy for their attempts to return to power by taking a stance against the interests of the state they long to rule. Every single day the beleagured nation of Pakistan receives one evidence or more that they are being lead by a herd of morons at all levels of political governance. Most recent one being a chap from Sind called Dr Muhammad Ali Shah. Story from Daily Dawn below describes. Pakistan was provided with yet another embarrassing moment on the world stage, this time courtesy of the country’s chef-de-mission at the 2010 Commonwealth Games in New Delhi where Dr Muhammad Ali Shah pulled off something that can only be described as a cheap stunt. For all those who missed the glittering opening ceremony of the Games yesterday, here is what happened: The Pakistan Olympic Association (POA) had decided over a month ago that Shujauddin Malik, the country’s gold medal winning weightlifter at the 2006 Commonwealth Games, would lead the Pakistan contingent during the ceremony. It was an honour well deserved for a man who not only won gold but also scripted his name in the record books for his 2006 effort. But as the ceremony started yesterday and teams strode into the Jawaharlal Nehru Stadium one by one, the Pakistani contingent despite receiving the most rousing reception out of all the participating nations, experienced a moment of great embarrassment. It wasn’t Malik who was seen carrying the flag and leading out the contingent but instead, it was Dr Shah – despite TV screens around the world displaying the name ‘Shujauddin Malik’. Fine, one thought. ‘maybe Malik wasn’t feeling up to it.’ But only moments later when people saw Dr Shah pushing aside Malik as cameras rolled, it was clear what the actual deal was. After the ceremony was over, weightlifting team manager Rashid Mehmood came on air and revealed that Shah had told Malik that it was the chef-de-mission’s right to lead the contingent as he was the ‘senior’ most out of all the personnel. Malik also came on air moments later and made another shocking revelation. He claimed, Shah after a tussle over the flag minutes before the opening ceremony, had threatened to send the weightlifter home if he did not respect Shah’s decision. I don’t know what’s more shocking, the insult meted out to the country’s unsung hero, who despite a lack of facilities and even proper shoes remains the most likely medal hope at the Games or Dr Shah’s claim that it was his right to lead the contingent. How he has earned that right is anyone’s guess. But it seems investing in a few club level cricket tournaments, jousting like a knight after a female sprinter achieved the unthinkable and criticising the Pakistan Cricket Board while being a part of the same setup, gives him the right to publicly humiliate a national star along with the whole nation in a desperate effort for airtime. Malik also revealed that he had controlled his emotions for Pakistan’s sake even as he was pushed and shoved into the background. After the incident, the weightlifting team had threatened to pull out of the games unless Shah apologised but later decided that it was best for the country’s image that they stay put. The Pakistan Olympics Association (POA) has announced it would be sanctioning the provincial minister over the matter. But Shah sahab has his connections, which would be enough to help him overturn POA’s decision. And we all know how much authority the POA really has. In a latest development Prime Minister Yousuf Raza Gilani has also demanded a report on the incident. I can safely predict the outcome of that: a meeting between Gilani and Shah and a press conference where the latter will apologise over the ‘misunderstanding.’ Even if Shah, in a most unlikely turn of events, is stripped of his position as Sindh Sports Minister, it will never come close to the honour Malik was robbed off. No amount of sanctions will really make a difference now for the damage has already been done. Can we seriously expect the weightlifter to compete in the event with the same intensity after his spirit was already deflated at the starting line? Whatever the outcome, it has to be said that Pakistani athletes must be the toughest mentally contrary to the common belief around the world as these guys face the most bizarre hurdles and yet once in a while manage to bedazzle the world. The whole incident while making a joke out of the country has also exposed the kind of mentality Shah and other people whom we thought were well-intentioned, passionate sports supporters really possess. They do it for the name and nothing else – especially not for the game. Pakistan's political scene is full of dichotomies. Politicians who represent the electorate and are not in the government often end up praying for Messiahs with boots to come and pull the country out of one abyss or another. Intelligentsia who chant for Western ideals of freedom and democracy often end up promoting special non-democratic routes to "technocrat" governance of for a badly governed country. And usurpers end up looking for legitimacy through concocted elections and by (without exception) creating their own Pakistan Muslim League - General Ayub, General Zia, and General Musharraf all followed the same path. Only General Ayub had the courage to leave disgracefully, but retire and die gracefully as an old man surrounded with his grand children. Unlike his predecessors who by the end of their tenure knew that they are unwanted illegitimate children of hunger for power, General Musharraf still suffers from a delusion of being a Messiah. An illegitimate usurper who's popularity is limited to 312268 (on 02.02.2010) followers in facebook and primarily among the affluent and Westernised urban elite in and outside Pakistan - a minuscule constituency that almost never votes in general elections. Launching his political party General Musharraf grudgingly acknowledged his lack of popularity among the electorate and apologised for his past"I am aware of the fact that there were some decisions which I took which resulted in negative political repercussions, repercussions which had adverse effects on nation building and national political events, and my popularity also, may I say, plummeted in that last year. I take this opportunity to sincerely apologise to the whole nation. Ladies and gentlemen, only God is infallible." Can a leopard change its spots: speaking to BBC Radio yesterday General Musharraf was still promoting the case for a military intervention in the Pakistan politics. He is still of the view that western democratic values do not have place in Pakistan and there is a special formula with explicit military role in governance of country is still the answer. I do, however, agree with General Musharraf that "total despondency and demoralisation and hopelessness which prevails in society today" require some radical changes in Pakistan's political scene. I also believe that as Pakistani citizen Musharraf has a right to get involved in, form a political party and seek a return to power through legitimate constitutional process - provided he demonstrate that he believes in one. I also believe that people of Pakistan have a right to hold him answerable for unconstitutional acts, excesses and crimes committed during his time in power. He has a right to return to politics. He also has a duty to face the people of Pakistan in a court of law. Some say that the UK citizens are suffering from Charity fatigue. Statement doesn't hold true when you hear heart rendering stories like the British Council staff in the UK who have just completed a gruelling triathlon covering the equivalent distance of the land boundary of Pakistan to raise money for the flood-devastated country. On 27 September, the final kilometre out of 6774 was covered ensuring that the team completed their challenge in just 27 days. The worst floods to hit Pakistan in recorded history have affected an estimated 20 million people, with six million in need of food aid. Although emergency relief is now well under way, the long term reconstruction needs are enormous. The UN estimates that over 10,000 schools have been totally or partially destroyed. In the picture one can see Cardiff team runners (from left to right) Bill Burson, Owain Wright and Sebastian Graca Da Silva and swimmer Edwina Lewis-Chaston, who between them covered over 500km for the triathlon challenge. 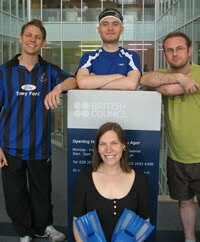 Twenty-three members of British Council staff, including Chief Executive Martin Davidson, came forward wanting to help. ‘I’ve really enjoyed being part of a team of colleagues raising money for a part of the world which has suffered so much and is an important part of the British Council family. My only problem has been forcing myself out of bed for when the swimming pool opened at 6.30 in the morning,’ said Martin. ‘The more I read about the relief effort the more I realised the urgency of the cause. If we can help keep the issue on the agenda, let’s – it’s the right thing to do,’ she added. He added that British Council staff in Pakistan have been donating to the Edhi Foundation, with generous donations made during Ramadan (the traditional time of giving - ‘zakat’ - to those in need). Further fundraising activity in the UK offices for those less keen on a physical challenge included a cake sale this week which raised over £400. There is still time to contribute to the campaign by visiting the team’s Just Giving page.